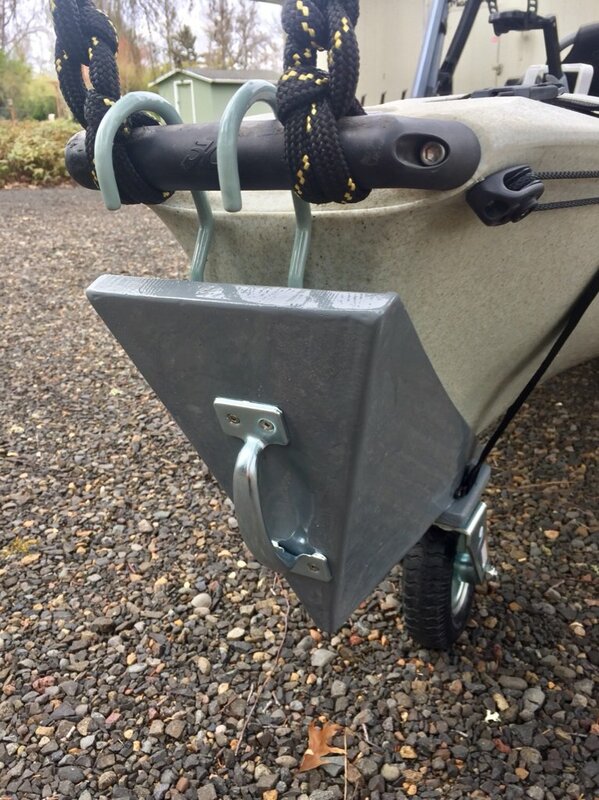 Hobie Forums • View topic - Wheel for the bow? Post subject: Wheel for the bow? I have the PA 14 which I love, but of course it can be a real beast to move around. I have wheels for the rear which is a tremendous help, but it can still be a major chore if you have to wheel it very far. Has anyone ever come up with a mod to put a temporary wheel up at the bow? 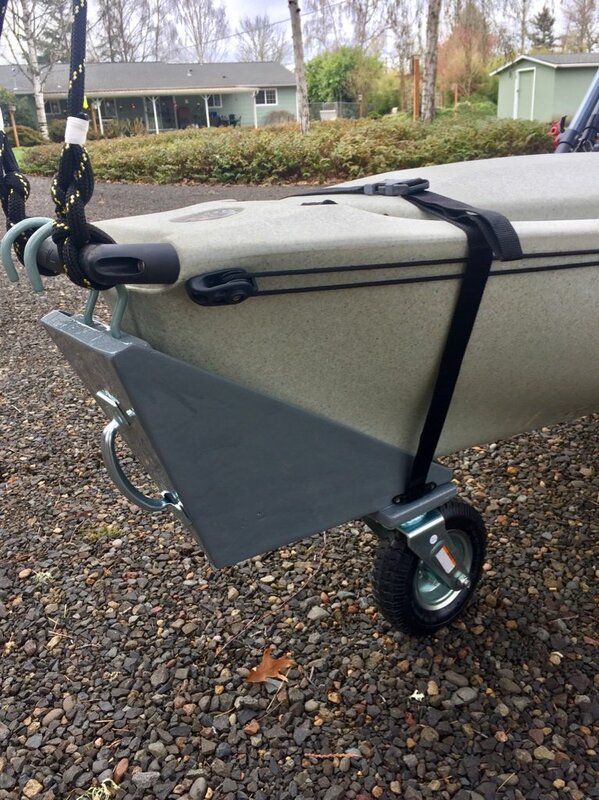 I’m thinking of something that hooks up through the bow rail and has a single swivel wheel so that the boat can be just pulled along like a cart without having to keep the bow lifted up. I’m going to try to mock something up but figured there’s no reason to reinvent the horse if someone has already done it. Post subject: Re: Wheel for the bow? 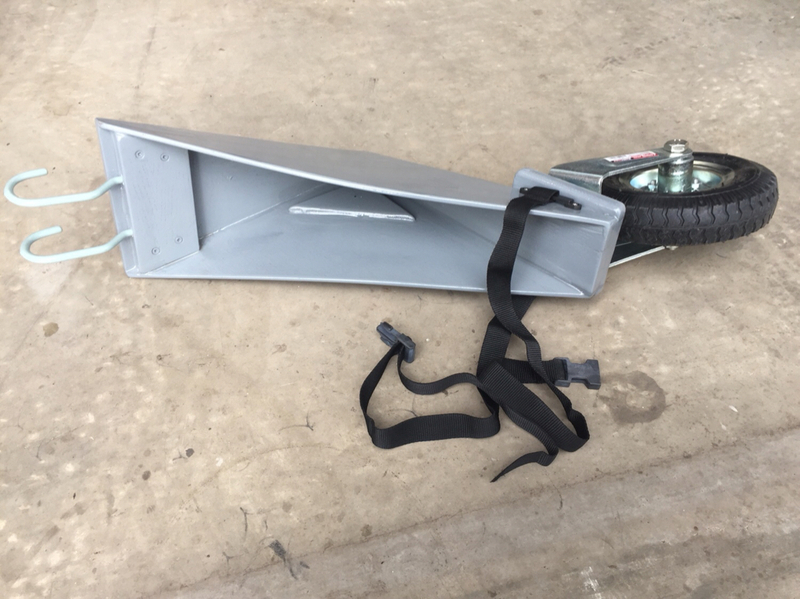 In addition to a rear scupper cart, I often put a cradle type cart under the bow of our PA 12's. As you note, it makes transport much easier by eliminating the need to lift the bow. 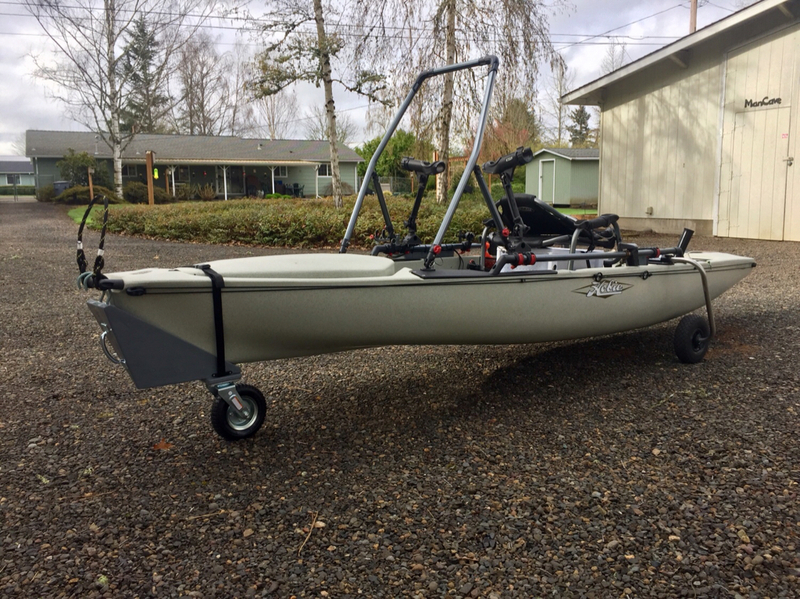 It has been simple enough to push the kayak even w/o any castor-type wheel for steering. Here is a pict of a cart we had from kayaks before the Hobie's we had. We also use it under the stern of our Tandem Island when putting up onto a roof rack. Finally decided I'd figure out my own bow wheel. Boonedox is supposed to be coming out with their solution any day, but I've got less than$20 in it since I scrounged parts from my shop. The most expensive part was the swivel wheel and I got it cheap at Harbor Freight on sale. So far I've only tested it in the driveway but it worked great!! I'll give it a real life test at a ramp tomorrow. Good to know until now no one is reporting boonedox causing cracks in gunnels. Im sure Hobie will come up with their own Boonedox design. I like your front cart as theres no need to drill and no pressure points in the hull. Nice to know how to weld.. There's no welding involved with this. All wood with fiberglass tape and epoxy on the joints. I'm not sure that the fiberglass was even necessary as the screws were holding pretty solid. The wood was what I happened to have in the scrap pile. 1/4" Marine plywood for the sides and 3/4" oak for the front and bottom. I used thickened epoxy as glue for the joints. That was a help because I didn't have to have them as tight as would be necessary for typical wood glue. I started with paper templates, went to cardboard and finally the wood. Pretty easy, really. I didn't try to fair it out and make it pretty to look at. I was simply going for functional. Looks like a great solution -- nice job! If you put a single wheel up front ensure that and shock of hitting an obstruction is absorbed as the momentum of a fully loaded yak will be substantial sher175's solution looks like it will absorb this without doing any real damage. Take into consideration corrosion issues if dragging along beach areas. Good points. One thing that I like is that the bow is completely supported. That said however, like any of the landing gears the boat should not be left on them for any significant time since the center is not supported. The only time mine will be used is while the boat is actually being moved. One thing this bow wheel is definitely NOT, is a wheel to be used in sand. To be most effective the wheel needs to swivel but the bearings are not protected and would quickly clog with sand and grit. Corrosion is something else to be watched, but the wheel will not be going into the water which will help. Products like Corrosion X will be a friend. I plan on using this in two primary ways. First, I don't like tying up a launch ramp for a little boat like this unless absolutely necessary and our ramps tend to get crazy busy anyway. I'd rather prep everything up in the parking lot and then wheel the boat down manually. The tripod wheels are really going to help - especially when pulling back up the ramp. And second, we want to take the boat when camping and it's not often you can get a site near the launch area. It's going to be much nicer to just pull the boat by hand. I got to use the bow wheel for the first time today in a real launching, and it worked wonderfully. The parking lot and launch ramp for the lake was gravel and the boat rolled easily. It's a keeper.